A simple form of racquetball developed in mid-19th century England, and even that game was preceded by Middle Age handball games played in Italy and France. 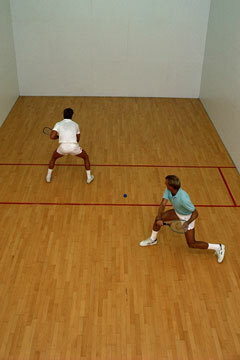 However, racquetball, as we know it today, is a game played on an indoor court with a racquet and ball. Developed in 1950 as an offshoot of squash and handball, it became a popular amateur recreation in North America in the early 1970s. Today, the enclosed courts can be found in many gyms and sports complexes around the United States. The International Racquetball Association (IRA) conducted the first professional racquetball tournament in 1974, and racquetball's popularity grew rapidly during the next decade, as many racquetball courts were constructed. In 1979, the IRA became the American Amateur Racquetball Association and the International Amateur Racquetball Federation was founded. Today, these organizations are known as the United States Racquetball Association (USRA) and the International Racquetball Federation (IRF), respectively. Racquetball courts are 60 feet long by 30 feet wide, and enclosed by four walls. The front wall features a horizontal "service" or "cut" line, with a play line below it. A line known as the short line intersects the court horizontally. The rear half of the court is divided vertically by the half-court line. There are two square areas known as service boxes adjacent to the short line on opposite sides of the court. The racquet is 13.5 inches long and up to 9 inches wide. The ball is hollow rubber, 2.25 inches in diameter, and weighs 1.4 ounces. Because of the speed of play, some players choose to wear protective glasses or eye guards. The game may be played with two players (the singles version), four players (doubles), or three players (known as cutthroat). The serve is made from within the service box to the front wall on the opposite quarter above the service line. Opponents alternate in hitting the ball until one of them fails to return it. All serves must be hit above the service line, and any returns must be above the play line. Much like in tennis, the ball must not bounce twice before being hit. 15 points wins the game, and two games comprise a match. If the match is tied, an 11-point tiebreaker decides the winner. Based in Colorado, the United States Racquetball Association is the national governing body for the sport of racquetball and works to promote and develop the sport's growth on every level in the United States. The International Racquetball Federation is the governing body for the sport of racquetball.